"For you," he says, as a smile begins to spill across his face and flow into my heart. "I knew you'd like it." I open my hand and oh, so tenderly, my husband tucks his "treasure" into my palm. No. Not a key to a "brand new", baby blue, 1965 convertible mustang, my dream car. No. Not a key to a quaint little villa in Tuscany, my dream home. No. Not even a key to a new house across town. A key to our front door. The same front door we have walked out into the world through for the past twelve years. As I look at the key resting in my hand, my smile now rivals that of my sweetheart. is not just any key. This key is a "cheetah" key. And, my husband is right. "Now, your house key won't blend in with the other keys on your key ring," he says matter-of-factly. "Now, you won't have to fumble around with all the others one before you find the right one. 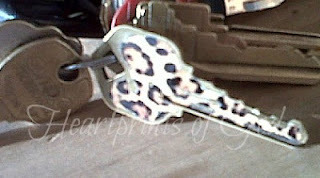 Now, it will be easy to spot your key, open the door, and just come on in." With his words, he speaks truth. With his gift, he has spoken love. ""For you," my Heavenly Father says, as a smile begins to spill across his face and flow into my heart. "I knew you'd like these." I open myself to Him, and oh, so tenderly, my God tucks His "treasure" into the center of my heart. No. Not a life of wealth, my dream life. No. Not even a life of ease, my dream life. So unlike the life I have walked the past forty years. As I look at this "new life" birthed in my heart, my smile now rivals that of my Abba Daddy. is not just any life. And, my Saviour is right. "Now, your life won't blend in with the world around you," He says matter-of-factly. "Now, you won't have to fumble around with all the other false gods of this world before you find The Way, The Truth, and The Life. Now, it will be easy to spot Me in the midst of your life, to open the door of your life to me, and to abide in me and Me in you." Stacey, thank you for always seeing the Lord in every day life. You often teach me the connection between the every day and God. My relationship feels so new right now even though I accept Christ as my Lord and Savior years ago. You help me to learn what that means and the way that it appears in my daily life!! You have no idea how much you touch my life and teach me with each of your posts. You are a true blessings from the Lord for me.Many blessings and hugs!! !